Chimney Linings, Garden Statues, Tile Mortars, Floor Systems, Underground Piping, Tank Bases, Pool Bases, Fuel Tanks, Tank Insulation, Counter Tops, Planter Pots, Decorative Brick, Gas Fireplace Logs. Proper Mixing will assure the maximum yield and uniformity. Low shear, low RPM mixers (similar to plaster mixers) are recommended for best results. Add all materials except perlite to mixer; then mix until this slurry is fairly uniform. About 2 minutes. Excess water and under mixing may reduce yield and workability. 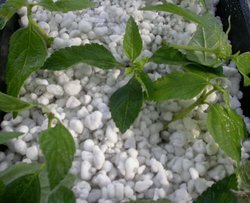 Over mixing may degrade the perlite and increase concrete density, reducing yield. Optimum mixing cycle can usually be determined with one or two trial batches.